I love my KitchenAid. Not only does it whip up the best tasting cakes, it also helps me in my quest to making the best fresh spaghetti, thanks to the pasta attachment. Last night I decided, for the second time, to try my hand at making fresh pasta. The first time hadn’t quite gone to plan and I ended up with slightly thicker tagliatelle than I wanted. Combined with too short a cooking time, it was a bit claggy and not overly pleasant. The inspiration for this dish came from one of my favourite food magazines, Donna Hay. I first discovered the magazine on my travels around Australia and was disgruntled when I came home, thinking that I wouldn’t be able to find it over here. I was wrong. Selfridges sells it, albeit at a premium price. But it is imported from Australia and it’s totally worth every penny. I love fresh, simple pasta so decided only to use my handy little tins of Nudo Extra Virgin basil oil, Nudo Extra Virgin Sicilian lemon oil, a lump of goats cheese and a sprinkle of salt and freshly ground black pepper. This dish is heaven. The pasta is easy to make and about ten times more satisfying than that cardboard you get from the supermarket. 1. Place the flour in a bowl and make a well in the centre. Add the edds and use a fork to lightly whisk, bringing the flour into the centre until the dough begins to come together and all the flour has been combined. Turn out onto a lightly floured surface and knead for 3-4 minutes or until the dough is smooth. Wrap in cling film and set aside for 30 minutes to rest. 2. Divide the dough into 4 equal parts. 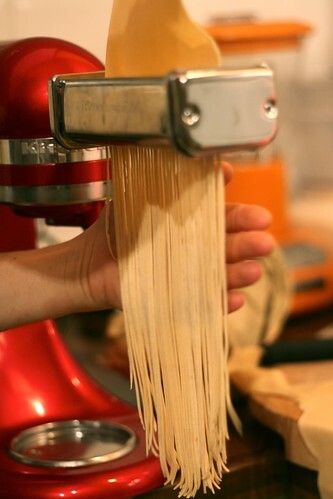 Set the pasta machine to position 1 and pass dough portion through the machine. Repeat 5-6 times, folding the dough onto itself each time and adding extra flour if necessary. 3. Set the pasta machine to position 2 and pass the dough through once. Repeat on each setting until you reach position 5. Lay the sheets of pasta on trays lined with non-stick baking paper. Repeat with remaining pasta portions. 4. 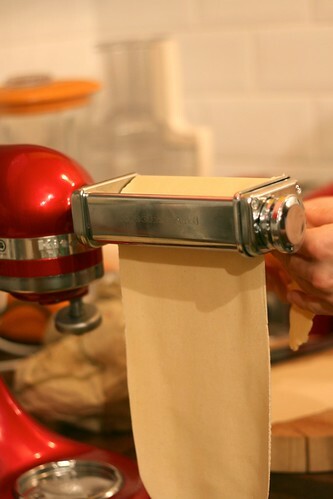 Add the pasta cutting rollers to the machine and pass the pasta sheets through, one at a time. 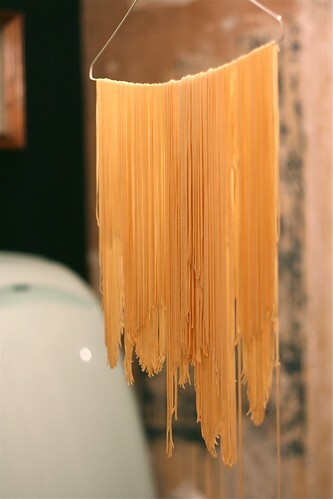 You can either cook the pasta straight away or hang it for 30-60 minutes. Cook the pasta in a large saucepan of salted boiling water for 3-5 minutes or until al dente. 5. 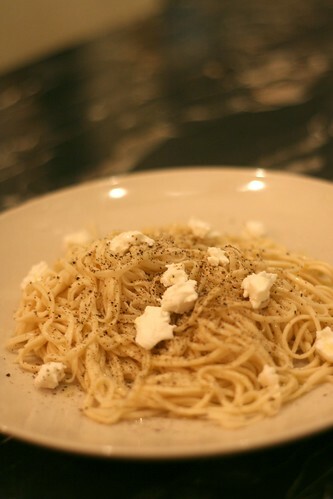 Stir through a good drizzle of both olive oils and a handful of goat’s cheese. Add a fresh grinding of black pepper and a pinch of sea salt and enjoy! Nice recipe. And love the smart use of your wire coat-hanger.